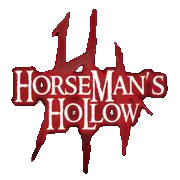 Horsemans Hollow is a Haunted Attraction located in Sleepy Hollow, NY. Horseman’s Hollow is handicapped accessible, as there are no stairs to negotiate through the installation. However, it is a walk-through experience along uneven, unpaved, soft-surface terrain. Handicapped parking is available, but your car must display a handicapped placard or plate.